Your next specialty beer could cost you a lot more. 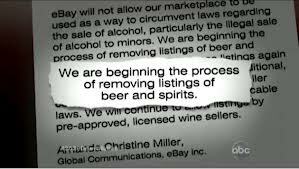 High demand for craft beers is creating a black market for some small batch brews, and unauthorized dealers are selling the beers underground (or online) for inflated prices up to 20 times above retail. “Whether it’s a top-rated brew or one with new or seasonal ingredients, everyone wants to get their hands on exclusive batches. The demand is certainly there, and people are stepping in to fulfill that need in unsavory ways,” said beer cicerone Anne Becerra. It’s common for craft brewers to release small or limited-time batches of a beer. Most of the time, it’s out of necessity. “For us, it’s a space issue,” said Russian River Brewing Company co-owner Natalie Cilurzo. “We are physically limited to producing a finite amount of beer due to property, building and ultimately, tank space. At some point there is just nowhere left to put one more tank.” Other times it’s particular ingredients, production costs and lengthy brew times that lead to smaller batches.